The National Funeral Directors Association released a survey that shows the average price of a funeral in the U.S.: $8,343, up 7.6 percent from 2009. At my library visit in Hastings last Saturday, the conversation turned to costs associated with a funeral. It’s my suspicion that when families plan a funeral, especially when they are forced to do so because the death was sudden, they are not really in a position to do a lot of questioning and/or bargaining of funeral expenses. 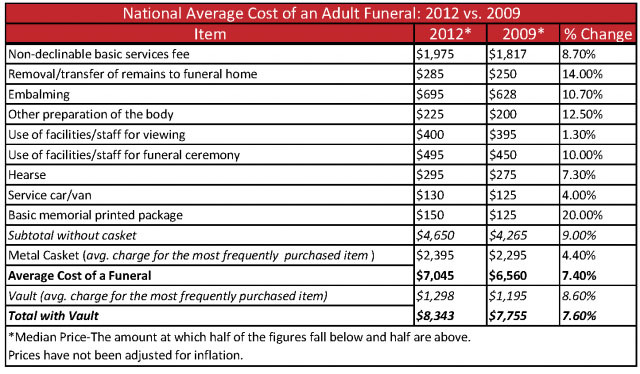 Actually, some of the funeral prices above surprised me. I always thought embalming was pretty expensive; I didn’t realize it costs less than $700. But what is included in the “non-declinable basic services fee”? That’s almost $2,000 that is standard. Is that basically labor and time? And a vault is going to be required by almost every cemetery I can think of. There’s another $1,300. 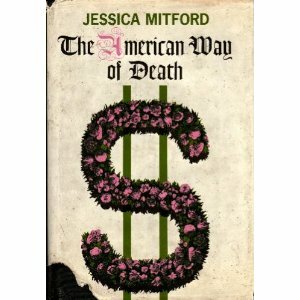 I think that Jessica Mitford’s The American Way of Death remains a classic for those who want to know more about the business side of the funeral industry. It was published in 1963 but the general concepts and questions remain the same. She published an update in 2000 but I haven’t read that one yet. Do you really think families are prepared to go through this itemized list in a time of grief? I’m curious to hear from people who have had to plan a funeral recently. Do you feel like you got enough information about cost?